This is what most people think of when they think of a Norden Bombsight. It is the true computing and bomb aiming part of the system. It is composed of the "rate end" or "computer end" on the right, the telescope in the middle, and the gyroscope on the left. They are all interconnected. The rate end is essentially an analog computer, and through the many knobs and levers information is fed into the computer. Time of fall information is input through the knob with the yellow dial, the disc speed knob. Trail is input through the lever on the upper left. 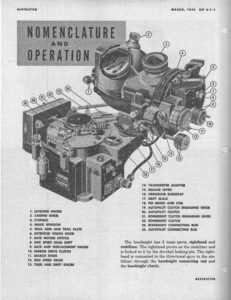 By synchronizing the mirror drive motor to keep the crosshairs locked ontot the target, the bombsight determines ground speed. All of these pieces of information are used to compute the drop angle. The rate end, therefore, also shows the sight angle and drop angle with indicators, and below them is the bomb release mechanism. In the middle is the telescope, and this is focused on a mirror. It is the mirror that is rotated by the motor to keep the target in view. The telescope is therefore connected to the rate end by a cable which runs over pulleys. The telescope is connected to the gyroscope by a lever arm. On the left is the gyroscope, which maintains a constant horizontal relationship with the earth. Norden gyros run between 7600 and 8400 rpm. The silver knob on top is the "caging" knob, which locks the gyroscope in place when not in use. The silver knobs to the left side are to level the gyroscope when it is not caged. This is faciliated by the bubbles on top of the gyroscope, identical to the bubbles on a carpenter's level. The sighthead was the nation's second most highly guarded secret in the United States during WWII, after the atomic bomb. It was removed from the aircraft after missions and kept in a guarded security facility. This is a much less common and less understood part of the Norden Bombsight system. 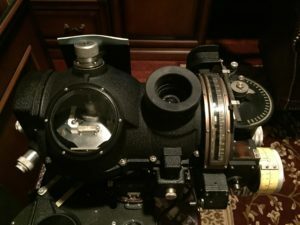 The Sighhead rested on the stabilizer, and was connected to it by a long stem protruding underneath the Sighthead, as well as through a connecting rod which went to the Bombsight Clutch. 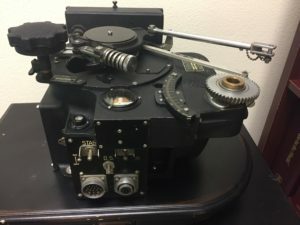 There were three major components of the stabilzer, a gyroscope, a servo motor, and the PDI (Pilot's Directional Indicator). The gyroscope was oriented vertically and was crucial to stabilizing not only the sighthead but the entire autopilot system. This gyro provided stability in the directional plane or azimuth; the horizontal gyro was located back further in the plane and provided stability in pitch and roll. When the aircraft turned, the stabilizer gyro would precess, or around its horizontal axis. This would cause contacts on the side of the gyro to energized electromagnets that were affixed to clutches. The clutches would then engage rotating gears on the servo motor, which would then rotate the entire gyroscope assembly in the opposite direction, causing the gyro to return to its upright position, reversing the precess. 2) Turning the autopilot on. Now the pilot can use his turn knob on the autopilot or the bombardier can manually turn the autopilot arm, or his own turn knob, which moves a lever in a box called the directional panel. This tells the autopilot to begin a turn. The aircraft will keep turning until it is stopped when the pilot or bombardier return their knobs back to the neutral position. 3) The Autopilot Clutch on the Stabilizer is engaged. Now the gyro in the stabilizer is stabilizing the autopilot arm, and thus the autopilot, through the directional panel. When the bombardier or pilot turns his knob, the aircraft will enter a turn but stop the turn when the knob is no longer being turned. This allowed the bombardier to turn the aircraft back and forth for evasive action. 4) The Autopilot Clutch on the Stabilizer is disengaged, and the Bombsight Clutch is engaged. Now the gyro is stabilizing the Sighthead, which is connected through a gear back to the autopilot arm, and thus the autopilot, through the directional panel. The bombardier is now steering the airplane as he manipulates the Sigthead, He would typically fly the aircraft from the initial point to the target using the bombsight, and return control of the aircraft to the pilot once the bombs were released.